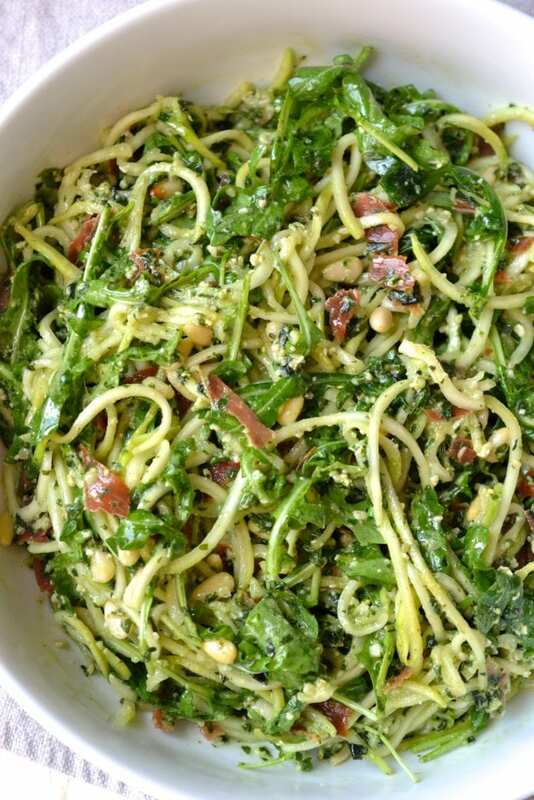 This is a healthy spin on pesto pasta salad that is simple but so tasty! 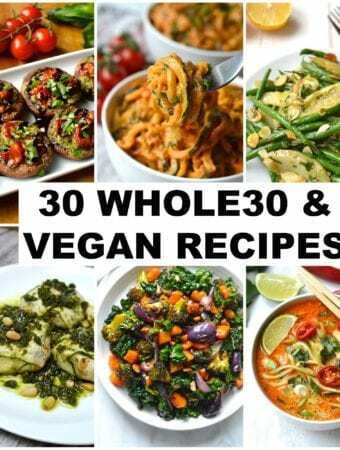 I used to make a version of this that was made with bow tie pasta and was packed with almost an entire block of parmesan, and I can truthfully say that this version that is Paleo, Whole30, Dairy Free, Grain & Gluten Free is just as good. Also if you skip the prosciutto its actually Vegan and Raw too! Ok so let me break this one down for you. 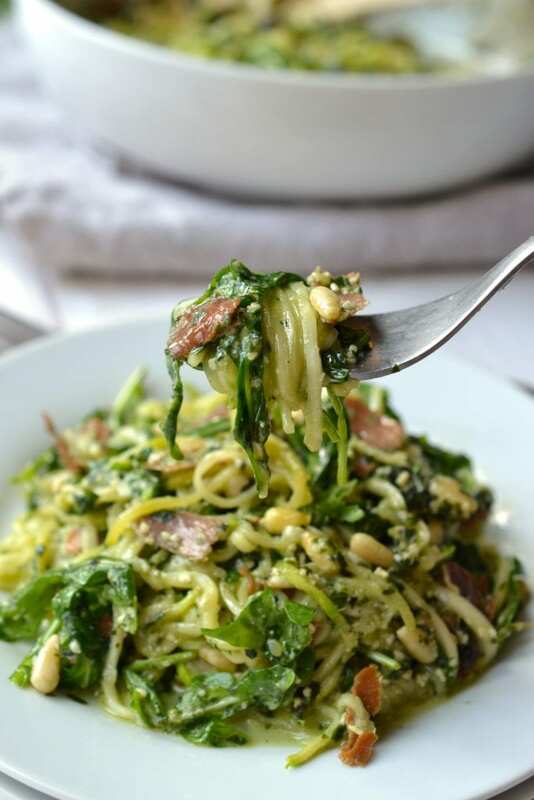 The base of this salad is zucchini noodles, which are then topped with crispy prosciutto, arugula (or rocket), pine nuts and a delicious pesto. If you don’t have prosciutto then you can definitely use bacon, but I highly recommend trying to find prosciutto. 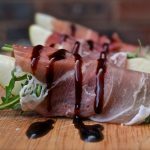 Have you ever tried baking prosciutto? It tastes like super salty and extra crispy bacon and is one of my favourite things to chop into salads. 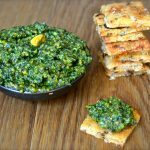 This is a very simple pesto recipe but I think it works perfectly for this salad. 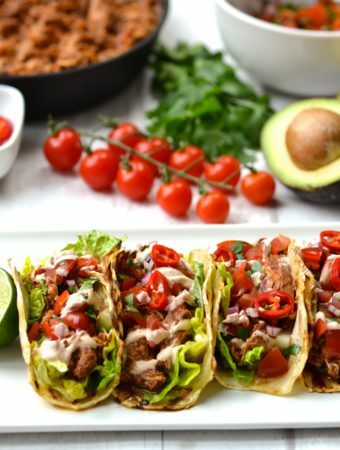 If you end up having any extra you can freeze it for another use. I really can’t emphasize enough how simple this salad is to make, but there is one crucial step that makes the difference between a delicious salad, and a soup. 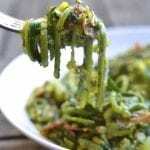 As anyone who has cooked with zucchini noodles before will know, they release A LOT of water. 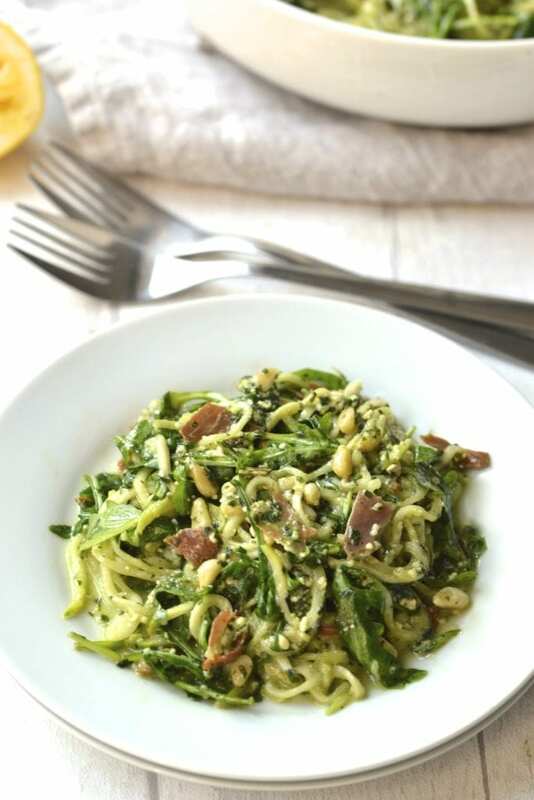 If you are eating the salad right away it won’t be a big problem, but as I live for leftovers and love when a recipe tastes just as good a few days after making it, removing as much liquid as possible from the zucchini is a crucial step. 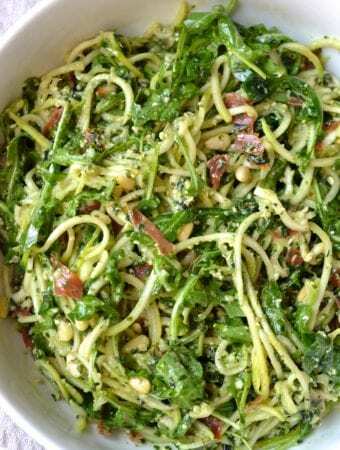 To do this spiralize the zucchini at least 20 minutes in advance, salt them and let them rest in a sieve for as long as possible. Just before adding the noodles to the salad, squeeze them between paper towel to remove as much water as you can. 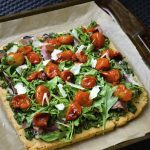 The leftovers are great for up to 3 days, but I recommend adding in a handful of arugula to the salad before eating to spruce it up a bit as the older leaves will have likely wilted. 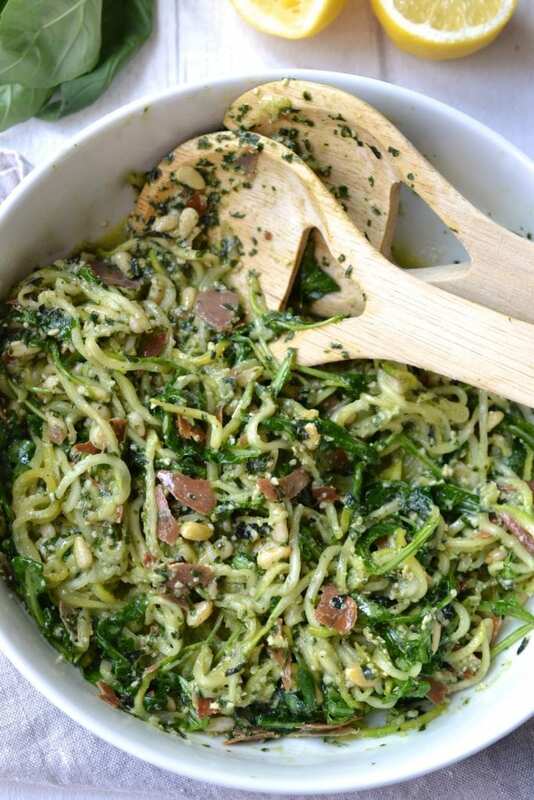 Place the zucchini noodles in a colander or sieve, generously sprinkle with salt and leave to rest for a minimum of 20 minutes, this will help draw water out of the noodles. 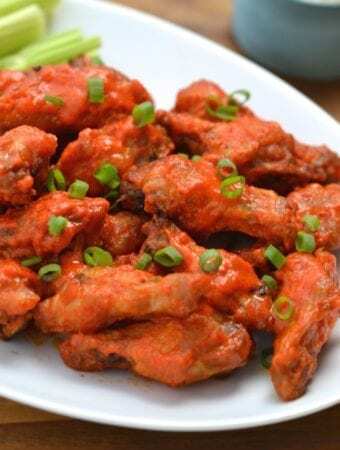 Preheat the oven to 175 degrees Celsius (350 degrees Fahrenheit). 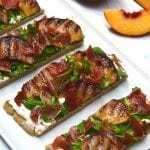 Lay the prosciutto out evenly on a parchment paper lined baking sheet and bake in the oven for approximately 12 minutes until its crisp. 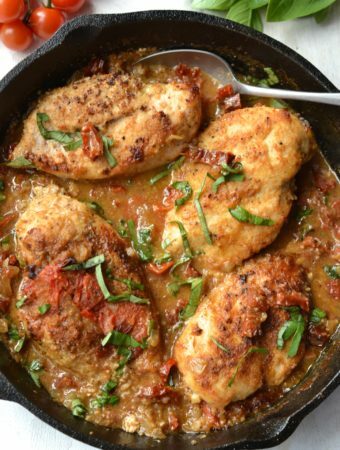 Once cooked, remove from the oven and break the prosciutto into small pieces. 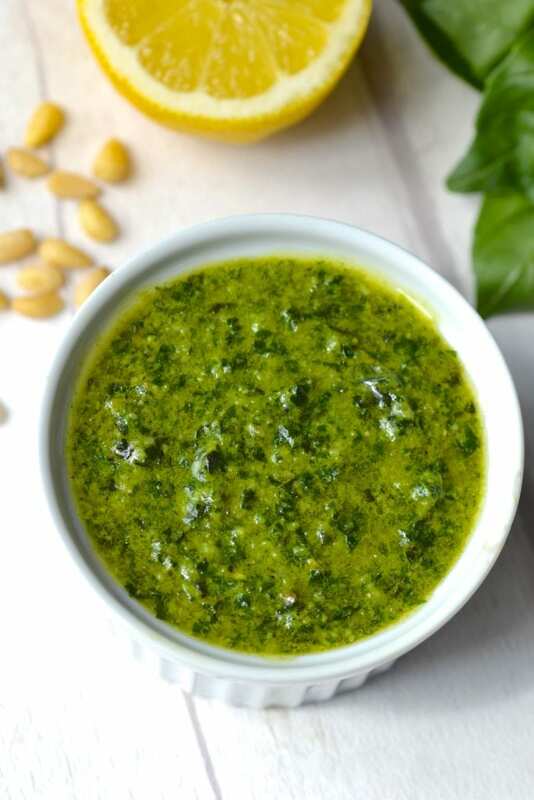 To make the pesto combine the basil, garlic, pine nuts, lemon juice, olive oil, salt & pepper in a food processor and blend until smooth. Set aside. 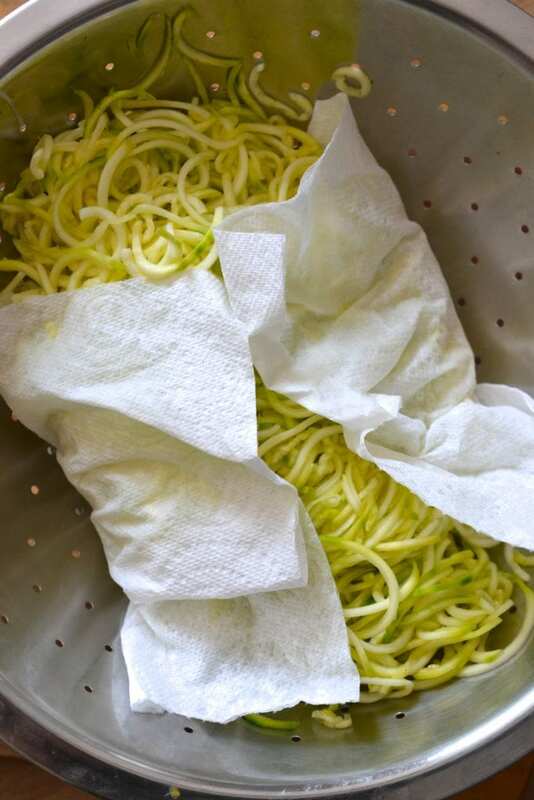 Place the zucchini noodles in between paper towels and squeeze to remove any excess moisture. 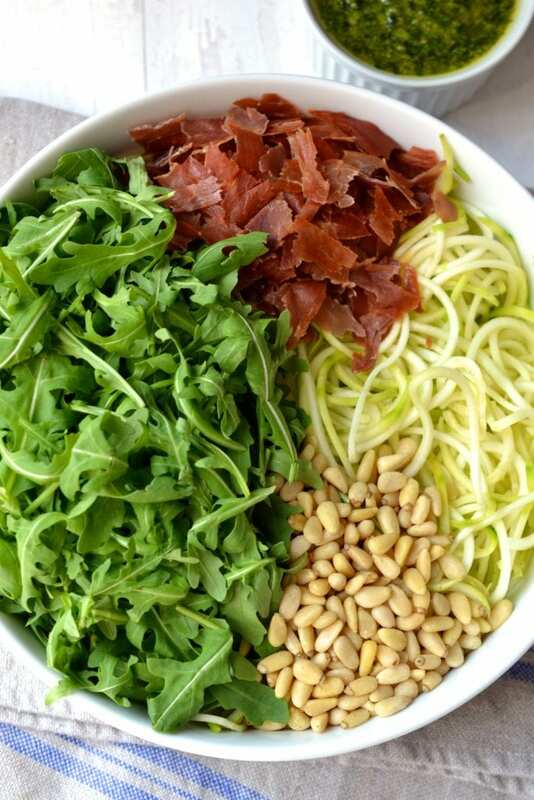 Place the zucchini noodles in a bowl along with the arugula, pine nuts, chopped prosciutto and pesto. Toss to ensure everything is mixed well before serving. 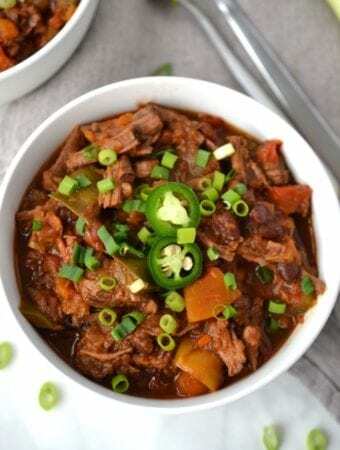 Really quick and delicious recipe. It already became a staple for us. 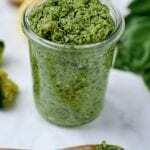 I now “mass produce” the pesto in advance, as it stays good in the fridge for quite some time and use the recipe as basis for variations on the salad. This was absolutely delicious!!! 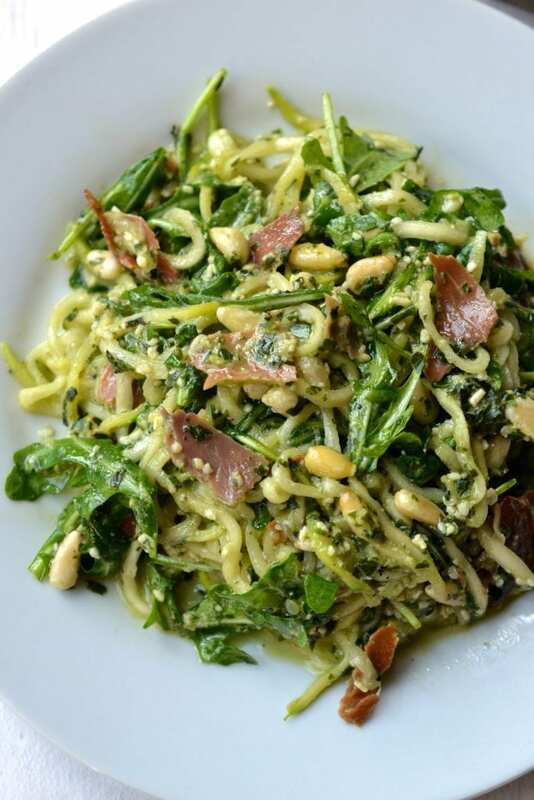 My husband who is not a huge fan of zoodles had seconds and couldn’t stop raving about how delicious it was. Thank you! !